Dr. Schreiber graduated in 2004 from ISU College of Agriculture with a Bachelor of Science. She double majored in Animal Science and Dairy Science. She received her DVM degree from ISU College of Veterinary Medicine in 2008. 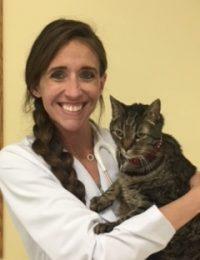 After college, Dr. Schreiber returned to her hometown of Dubuque, where she has practiced small animal medicine for 10 years. Her areas of interest include: dentistry, exotic pet medicine and geriatric pet care. Dr. Schreiber is married to Shawn and they have 3 young daughters. Outside of work her hobbies include: horseback riding, boating and DIY projects with her kids.